Chris Bryant, independent scholar and investor in the room, paid $21,600 for this watercolor rendering of Paul Revere’s iconic “The Bloody Massacre.” It has impeccable provenance and was cataloged as perhaps having been done by Christian Remick, known to have worked with Revere. The script below the image may be in Revere’s hand and is presently being researched. Revere’s “The Bloody Massacre” engraving is challenged as having been plagiarized from a work by Henry Pelham. CAMBRIDGE, MASS. – Carl Nordblom’s well-attended January 27 sale included a collection of marine chronometers, early American furniture, Eighteenth and Nineteenth Century Spanish silver from Central and South America, a weathervane, midcentury furniture and decorative arts, a selection of paintings, one of which, a portrait of a man with a monkey by Randall Davey, was the highest priced item in the sale. But the sale also included what may have been one of the most important pieces of Americana to hit the market in recent years. 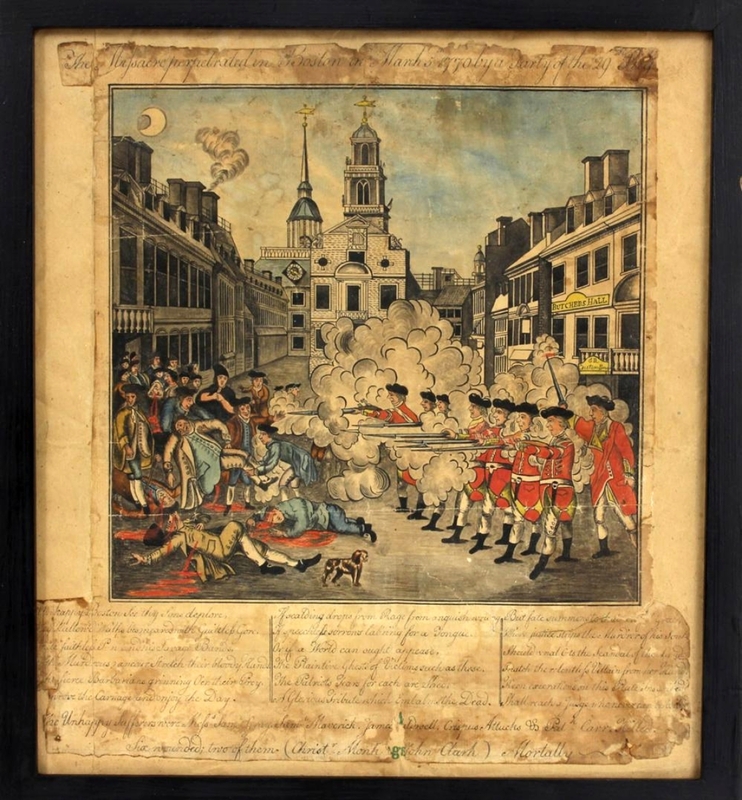 It was an ink and watercolor drawing that matched Paul Revere’s iconic engraving, “The Bloody Massacre,” more commonly known as the “Boston Massacre.” The identity of the artist was not known but Nordblom’s catalog speculated that it may have been done by Christian Remick, who is known to have worked with Revere on other engravings. However, the handwritten text under the image is very similar to the handwriting in Revere letters digitized online by the Massachusetts Historical Society (MHS), as well as several Revere engravings, including “A View of the Year 1765.” It descended in the Doggett family until consigned to Nordblom. The first John Doggett came to Massachusetts in 1630 along with Governor John Winthrop, A. Samuel Doggett, born in Dedham, Mass., in 1751, was an officer in the Continental Army during the Revolutionary War. Additional research may establish when the Doggett family acquired this drawing. Might this be a “first draft” of the iconic print? Revere published his engraving in March 1770, just three weeks after the “massacre.” He was an ardent patriot, active in the Sons of Liberty and used his engraving skills to produce prints after his own designs and those of others as political propaganda. The “Massacre” engraving was intended to stir anti-British sentiment among citizens of Boston and abroad. Five of the 20 or so participants shot by the British would eventually die of their wounds. The MHS description of the event and the engraving states that Revere likely copied his engraving from a work by Henry Pelham, an artist and engraver who appears to have created the original image and lent it to Revere. Revere got his version to market a week before Pelham did, and Pelham wrote to Revere, accusing him of acting dishonorably and taking credit for his work. The watercolor up for bid at this sale was purchased by Christopher Bryant from Manchester, Mass., an independent scholar and investor, in the room, for $21,600, the second highest price of the day. Bryant spotted the observations described above and is currently researching the piece further. The top seller of the day, “Man and His Monkey,” a large, circa 1915 oil painting by Randall Davey (1887-1964), had been on loan to the Corcoran Gallery in Washington, DC. It sold for $24,000. The artist’s works hang in the Whitney and several other museums. Works by other painters were also included in the sale. A still life of roses and fruit by Belgian artist Jean-Baptiste Robie (1821-1910) earned $6,600, and an etching, “The Limeburner,” by James McNeill Whistler (1834-1903) signed and dated 1859, brought $3,000. A suite of 20 hand signed lithographs by Salvatore Dali had been consigned by a gentleman who said they had been obtained from Dali’s secretary, Robert Descharmes. Whether or not they were from the original edition was not determined, and Nordblom’s catalog states, “This group of lovely prints is being sold for what they are with no inference that they are from the original 1951-1964 series.” The group sold for $1,800. Before the sale, Nordblom said that there had been strong international interest in the collection of more than 30 chronometers that were to start the sale. 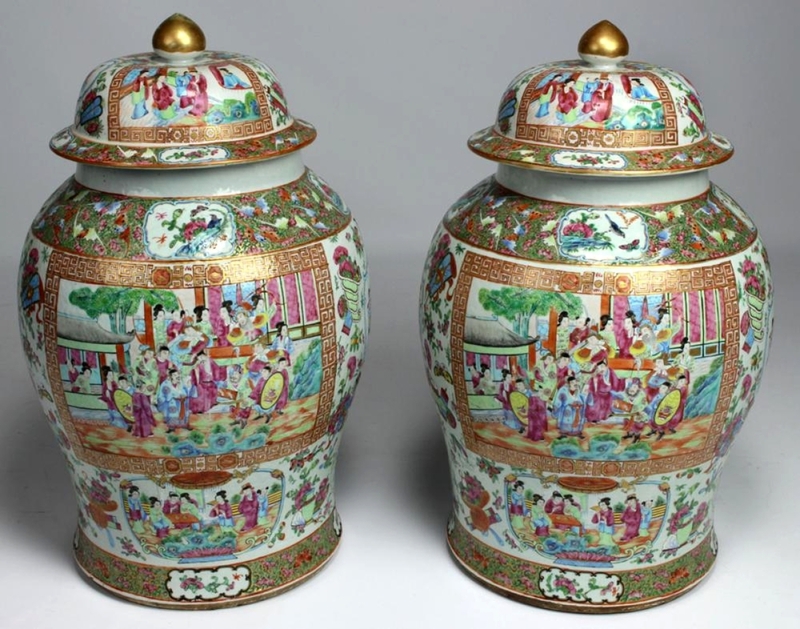 He said that potential bidders had closely examined the collection and they obviously were satisfied with what they saw. 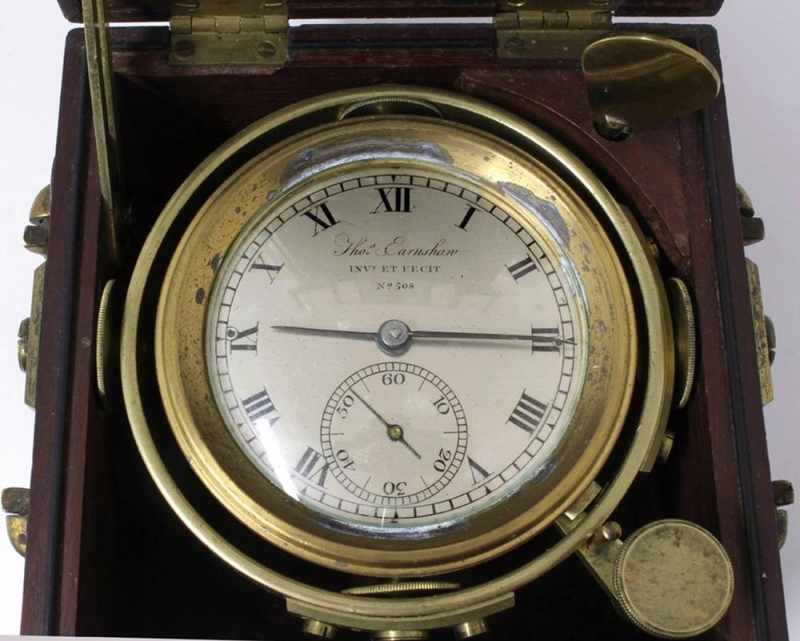 The first one to be sold was a marine chronometer in a three-tiered case, marked on the dial “Thos. Earnshaw/Invt. Et Fecit/ No 508.” According to the catalog, “Thomas Earnshaw (1749-1829) is known as the Father of the Chronometer, and the device brought the highest price of the group, $10,200. A two-day example by Charles Frodsham, in an up-and-down bayonet case, sold for $7,200, and another example by the same maker, marked on the dial “Charles Frodsham/84 Strand London/3313″ brought $5,700. Nearly all sold well over their estimates. 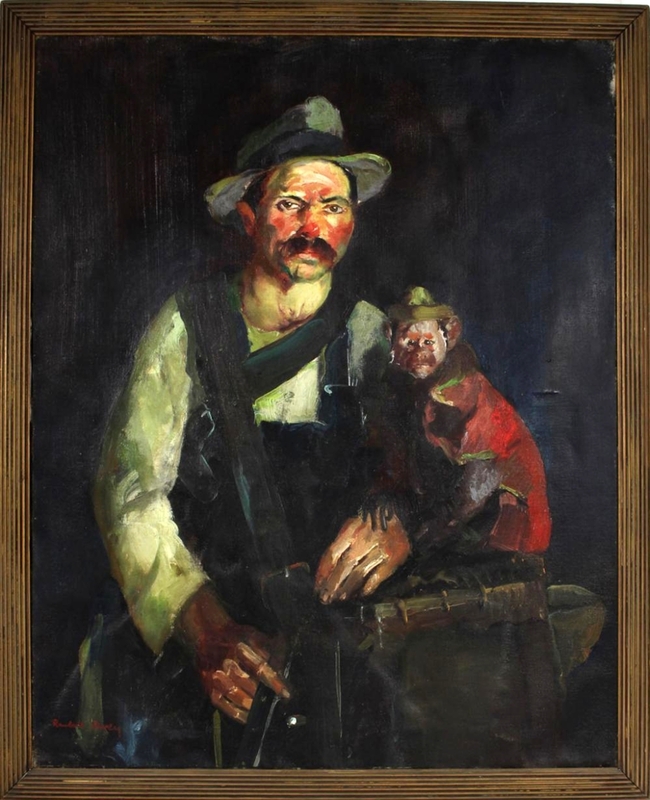 The highest priced item in the 350-lot sale was a circa 1915 oil painting, “Man and His Monkey,” by Randall Davey. The painting, which had been on loan to Washington’s Corcoran Gallery, sold for $24,000. 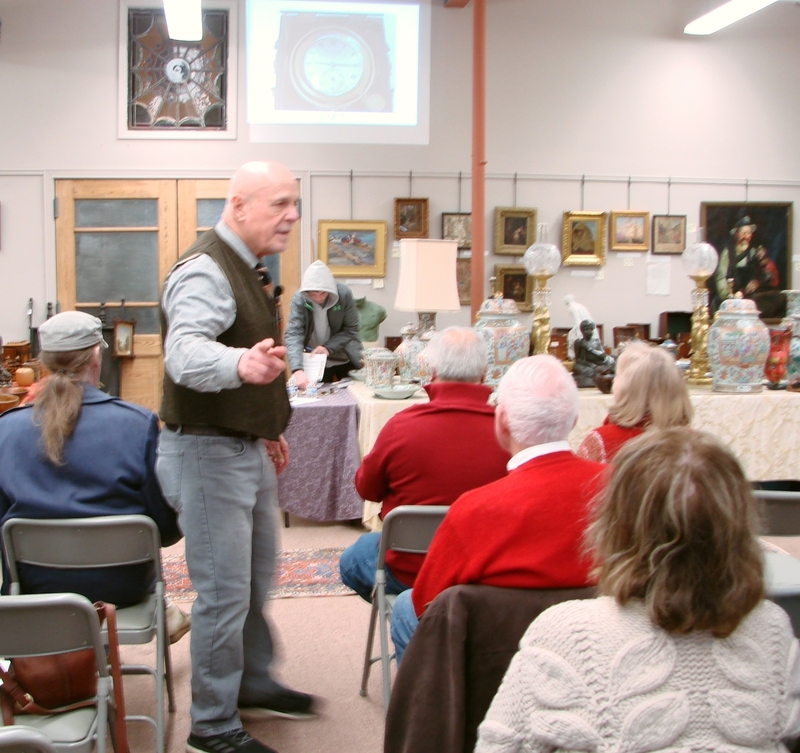 Nordblom is knowledgeable about American furniture and good pieces often turn up in his sales. 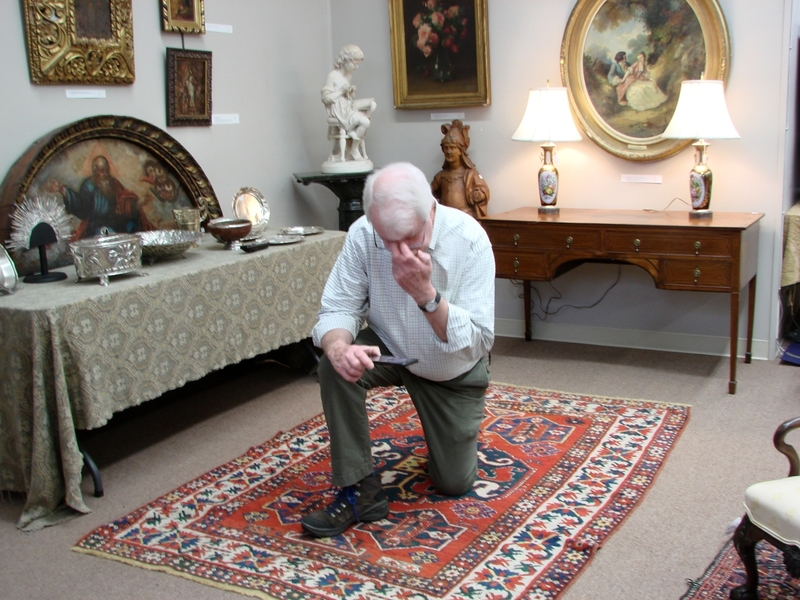 Gary Sullivan, a Canton, Mass., dealer and author, bought the highest priced piece of American furniture in the sale. 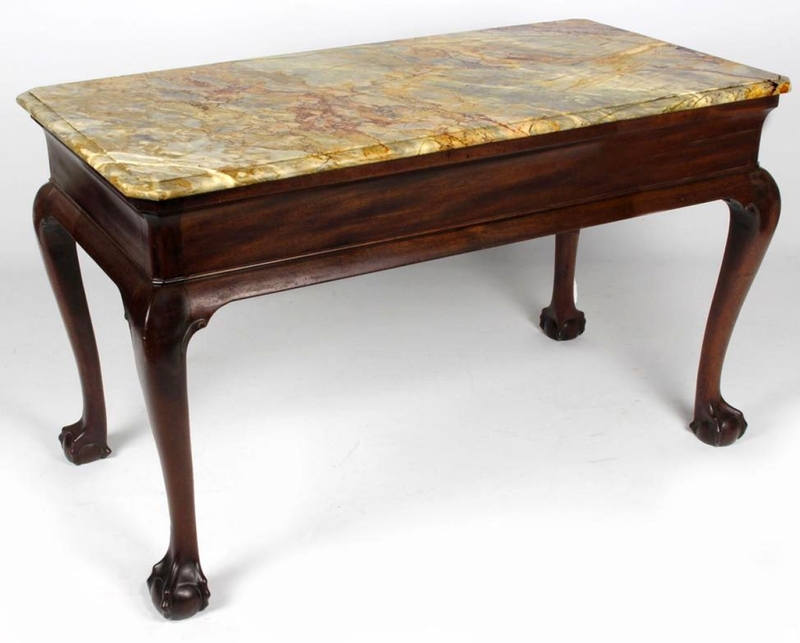 It was cataloged as “a marble top console table, Boston, circa 1750, with finely carved ball and claw feet.” Sullivan said it should more properly be called a side table. 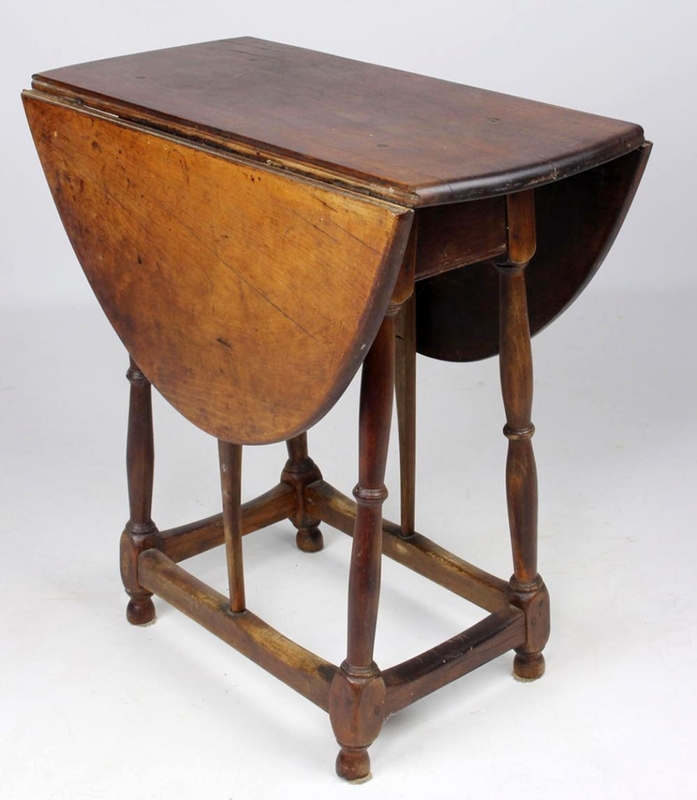 “I’m delighted to have been able to get this table. It’s a rare form and I’m pretty sure it was made in Newport, probably by a member of the Townsend-Goddard school,” said Sullivan. “The marble top was a carefully selected piece and is original. A very similar table is pictured in the catalog for the 1965 John Brown House loan exhibit of Rhode Island furniture. I’ll do some research to see if I can determine which cabinet-maker made it.” He paid $12,000 for the table. 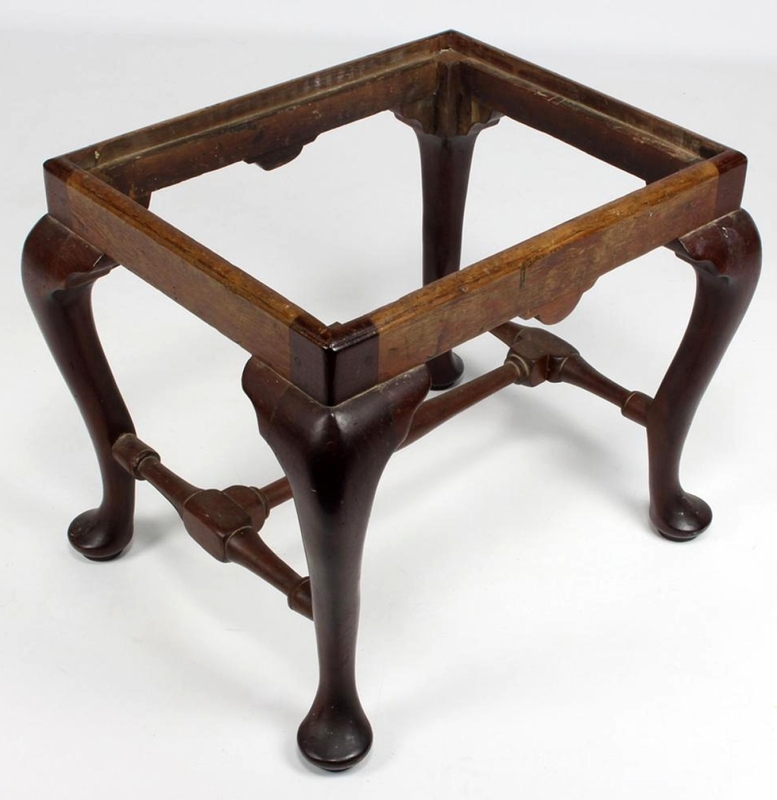 An Eighteenth Century mahogany Queen Anne foot stool, missing its seat, went to a phone bidder for $4,500, and a small cherry Pilgrim Century butterfly table on widely splayed legs realized $9,000. 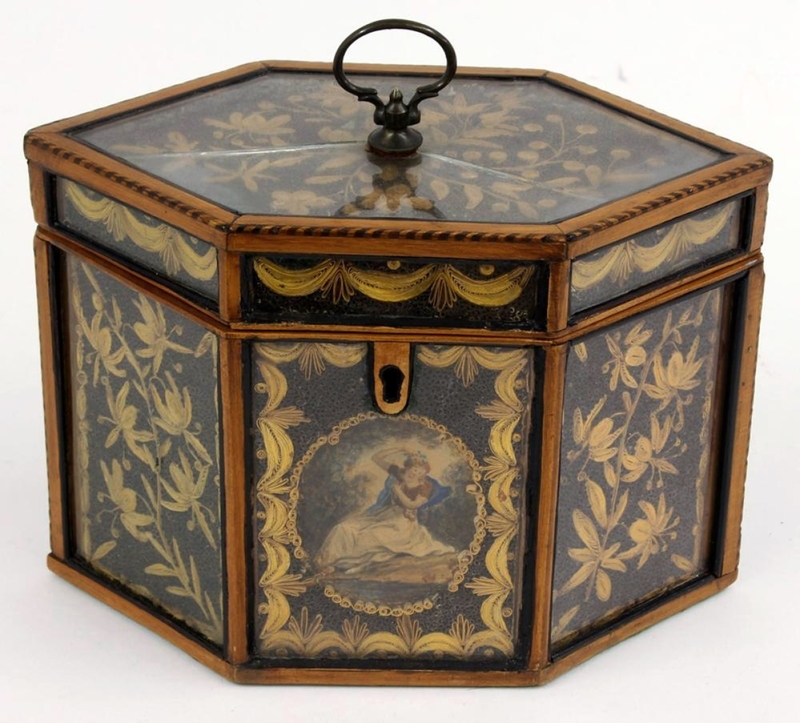 It was dated to 1680-1710, retaining the original hinges and surface. 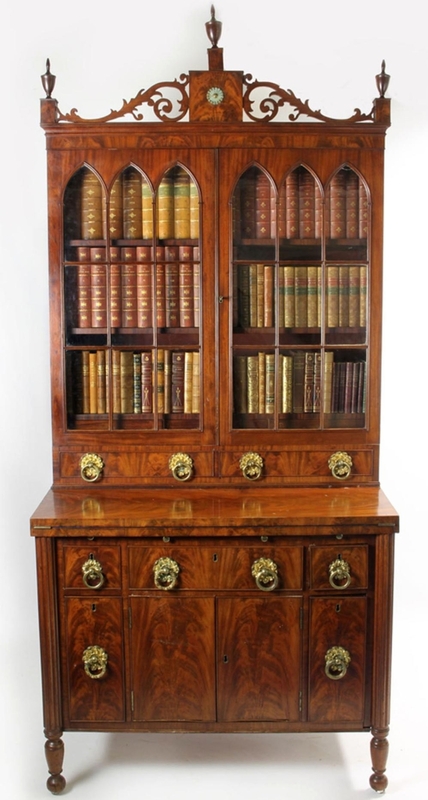 An attractive mahogany Seymour-school secretary/desk with pierced fretwork and finials above gothic arch glazed doors and with three drawers below sold for $6,600. 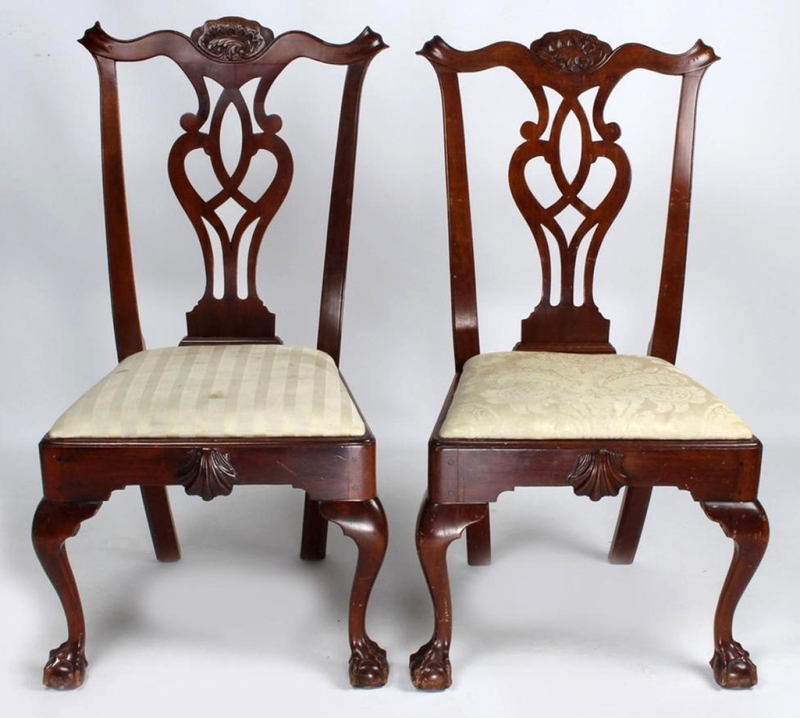 Finishing at $10,200 was a pair of carved mahogany Philadelphia Chippendale side chairs. 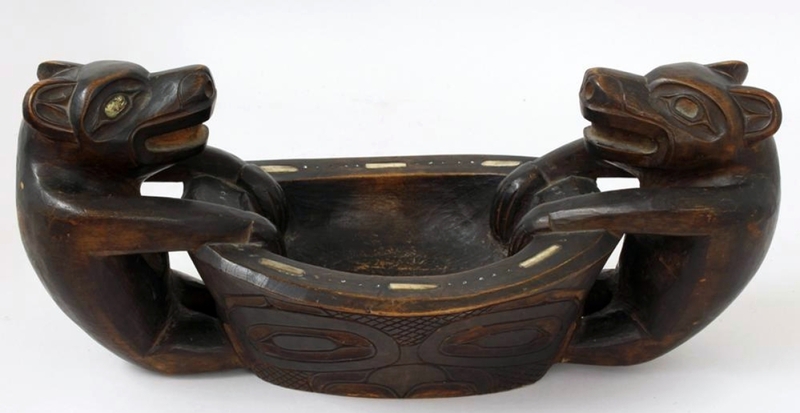 The seat rail was shell-carved, and the crest rail and ears were also carved. Literally saved from the wrecker’s ball was a midcentury rosewood Hans Wegner “Papa Bear” armchair with its ottoman. Selling for $10,800, it came from a home in Brookline, Mass., that was in its final stages of disrepair. There were midcentury accessories that created interest. An incised and decorated Scheier pottery bowl was a good buy at $330, while a colorful, 17Ã½-inch signed and dated charger by Bjorn Winblad reached $780. 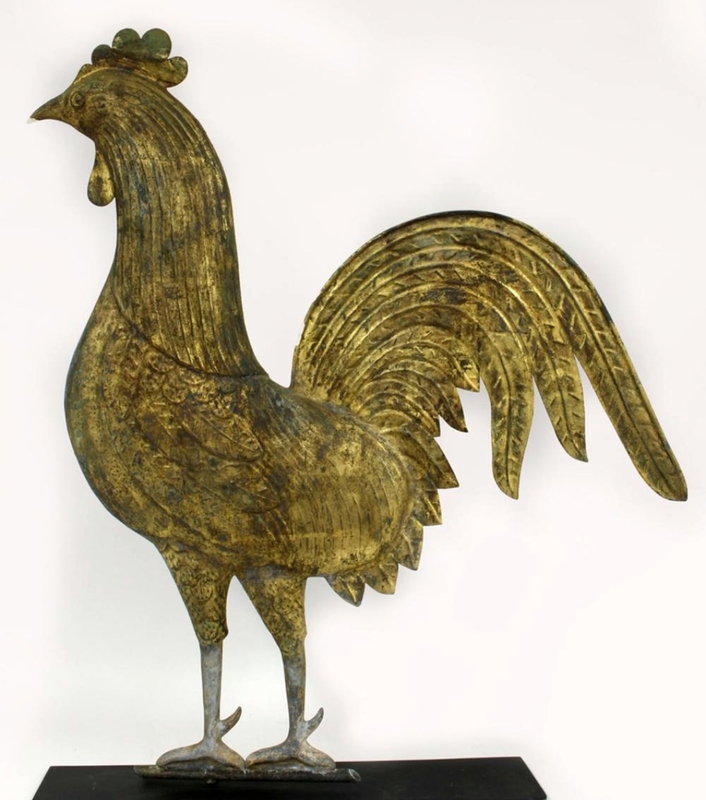 A small, limited edition 1952 ceramic plate in the Picador pattern, designed by Pablo Picasso, reached $1,440. 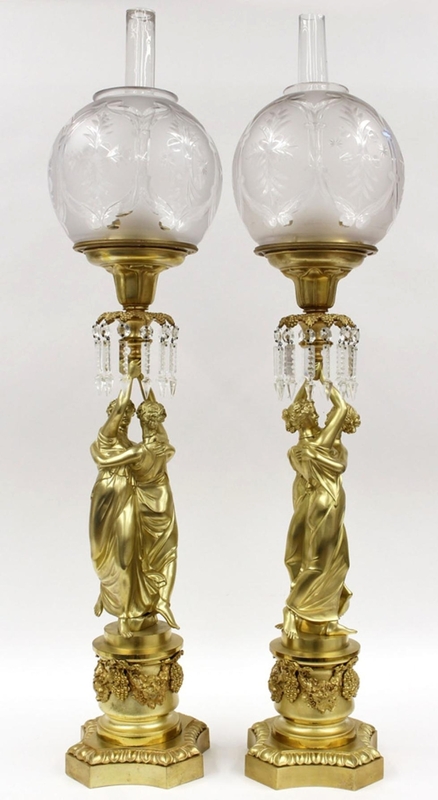 A pair of midcentury cast bronze candleholders marked “RPS” weighed 21 pounds and achieved $420. 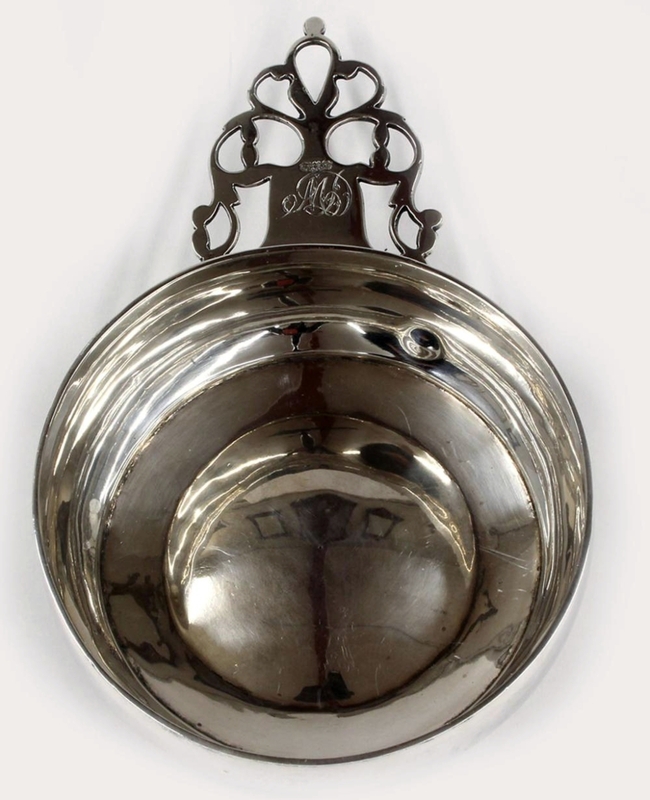 Over the last few sales, Nordblom has been dispersing a collection of Spanish silver from Central and South America. 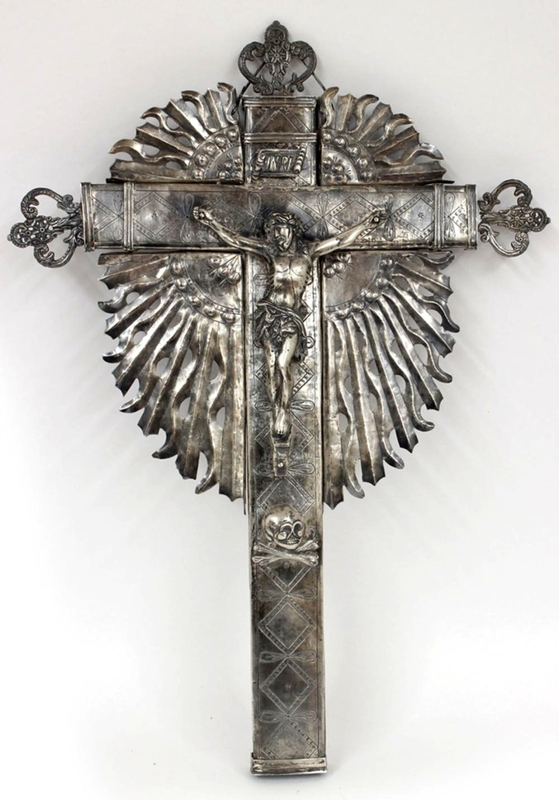 Topping the selection in this sale was a Nineteenth Century silver crucifix from Bolivia that was 21 inches tall, surmounted by a crown and with a skull and crossbones at Christ’s feet. It sold for $3,600. An engraved Spanish colonial silver Eucharist casket, with cover and dated 1722 from Guatemala earned $3,000. 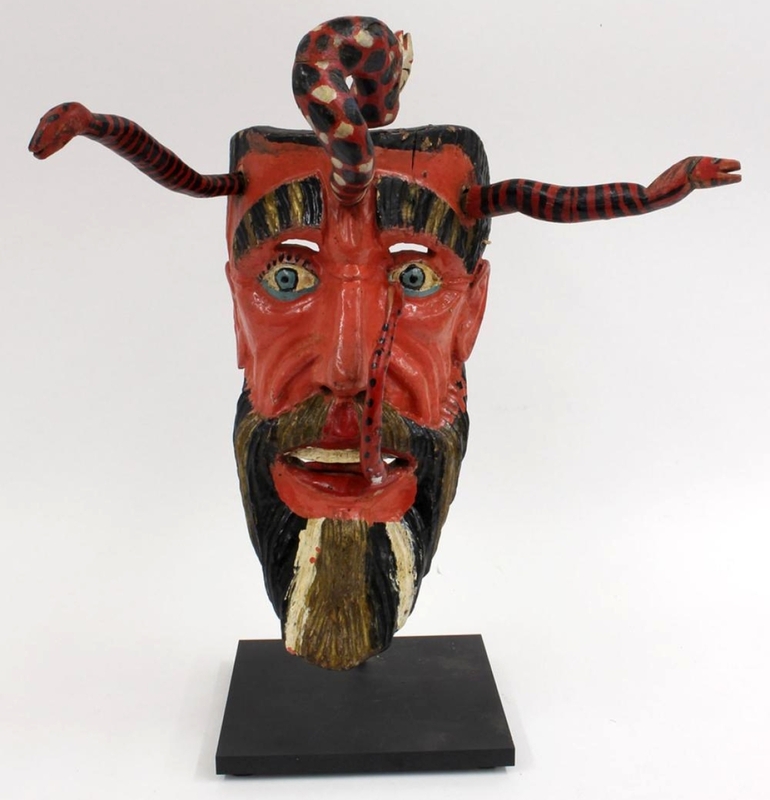 Also from Guatemala came a carved and brightly painted devil mask with three horns, which brought $2,520. 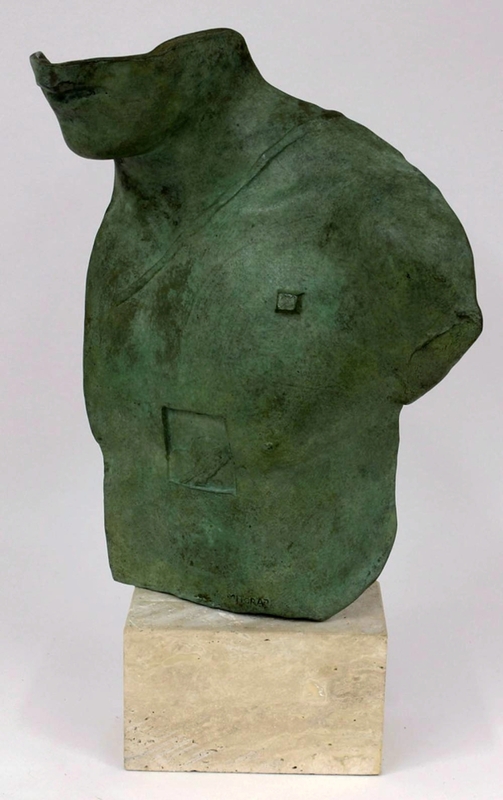 A few days after the sale, Nordblom said the sale grossed more than $560,000. “That was okay for a small sale – we had fewer than 350 lots. The consignor of the Revere piece was quite happy with the price we got and we’ll be getting more material from the family. 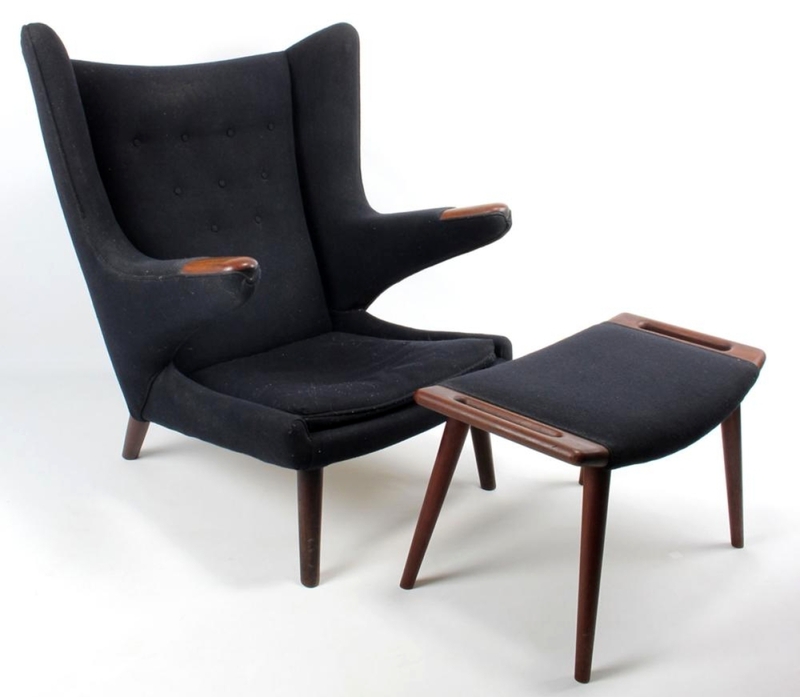 The Wegner chair was certainly a pleasant surprise to its owner. We had good American furniture and it did well. 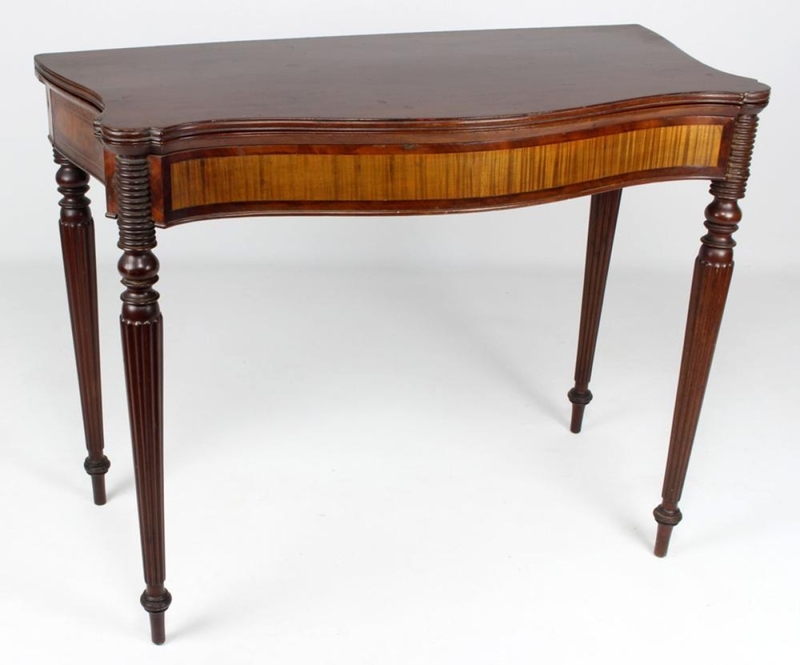 The table Gary Sullivan bought was a very good piece and he got a good buy. Nearly everything we sell is without reserves, so I only pass something when I see there’s no interest.” Be warned: his sales are fast-paced. If he doesn’t quickly get an opening bid on an item, he’ll pass it. Prices given include the buyer’s premium as stated by the auction house. For information, www.crnauctions.com or 617-661-9582. 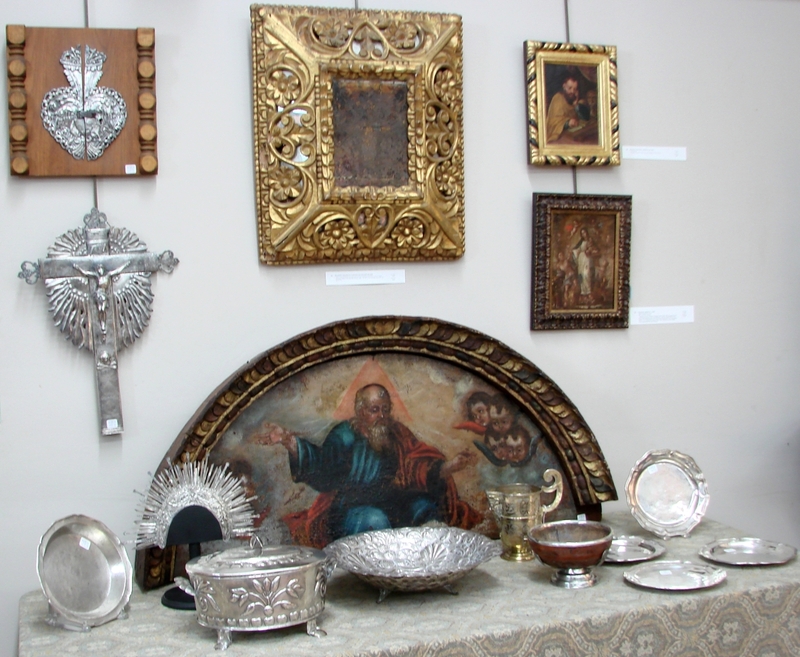 Some of the Spanish silver on display during the preview.